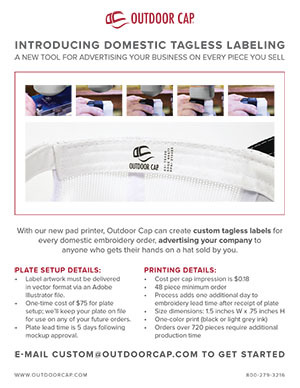 With our new pad printer, Outdoor Cap can create custom tagless labels for every domestic custom order, advertising your company to anyone who gets their hands on a hat sold by you.  Label artwork must be delivered in vector format (preferably Adobe Illustrator file). One-time cost of $75 for plate setup; we will keep your plate on file for use on future orders. Plate lead time is 5 days following mockup approval. Cost per cap impression is $0.36 (A). 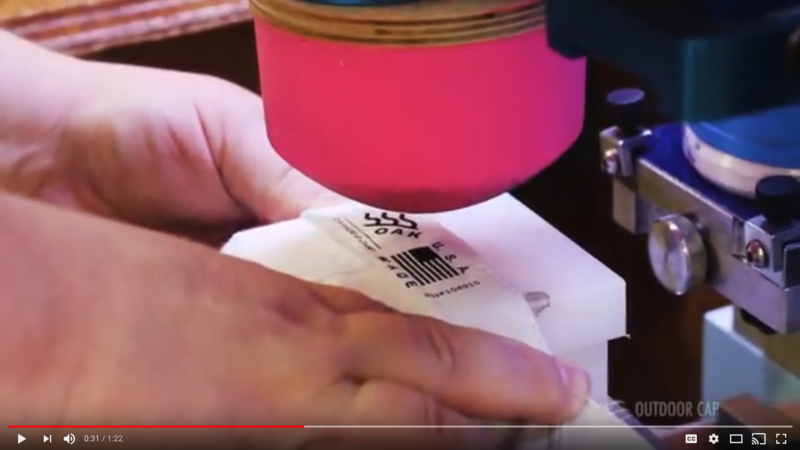 Process adds one additional day to embroidery lead time after receipt of plate. Size dimensions: 1.5 inches W x .75 inches H.
One-color print (black or white ink). Orders over 720 pieces require additional production time.